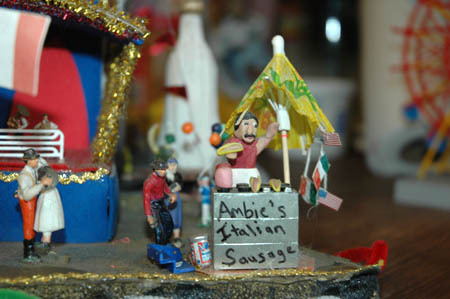 It’s late March and we are well into planning the folk craft area of the 2012 Lowell Folk Festival. Though the festival is best known for its music and food, there has long been a vibrant showing of traditional craft by artists who demonstrate their work under tents located along the canal in Lucy Larcom Park. The theme for the area this year is “Head to Toe” and we are in the process of identifying people who craft a variety of head gear (hats, Caribbean carnival headdresses, crowns, head wraps, etc.) and foot wear (handmade shoes of all kinds). 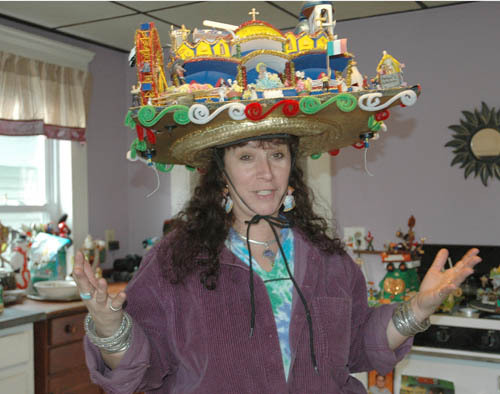 High on my list for awhile has been finding the Hat Ladies of Fiesta. The first I’d heard of them was in the summer of 2009, when I was lucky to have two college interns who spent the summer documenting ethnic festivals around Massachusetts. (Ellen Arnstein and Signe Porteshawver’s fieldwork is sprinkled throughout our Keepers of Tradition website). A highlight for them was attending Gloucesters’ St. Peter’s Fiesta in late June, which honors the patron saint of fishermen. In amongst their photos were shots of two women wearing fantastic hats. After a little research I discovered their identity: Robyn and Amy Clayton. 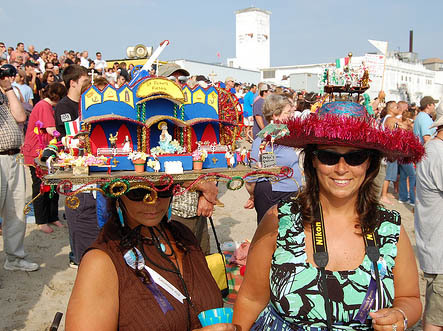 As it turns out, the Clayton sisters are known around Gloucester as “The Crazy Hat Ladies of Fiesta.” Their outlandish hats have become an integral part of St. Peter’s Fiesta. I wrote them a letter back in December and soon after had an invitation to come meet with them in Gloucester to learn all about their hats. What started as a backyard party 18 years ago has grown into a highly anticipated display of creativity. It’s just around this time of year that Robyn and Amy begin working on their Fiesta hats. 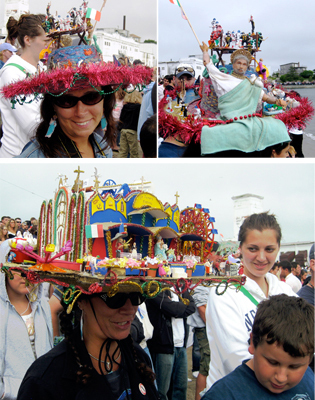 Made from scratch, each hat replicates in miniature key elements of Fiesta: local churches, temporary altars, the St. Peter statue, the greasy pole competition, Gloucester’s fishing fleet, concession stands, and carnival rides. A couple of weeks ago, I found myself sitting at the kitchen table in Robyn Clayton’s home. Spread out on nearly every available surface were hats from previous years and supplies for creating this year’s hats including large light slabs of foam core, pipe cleaners, glue, popsicle sticks, paint, Sculpey clay, Legos, and HO-scale model railroad figures. Robyn modeled last year’s hat for me. “My friends joke that when I put this hat on, I’m going to need some kind of out riggers because they think it’s so heavy, but it really isn’t heavy. 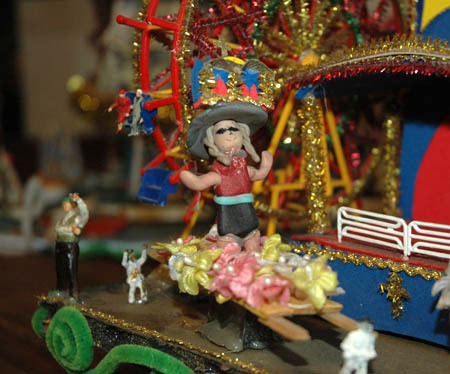 It’s just a little awkward if it’s really windy out.” Not to be missed is Robyn’s replica of herself on her hat, wearing her signature hat, standing in front of the working Ferris wheel. The original life-size statue of St. Peter, which was brought over from Italy in 1927, remains the centerpiece of what has become a five-day celebration. Recently, Robyn was inspired to make her own statue of St. Peter. During the year, the statue of St. Peter is kept at the Saint Peter’s Club on Rogers Street; Robyn’s Saint Peter hibernates in her cellar. The Clayton sisters are elated to be coming to the Lowell Folk Festival this July, where they will join a variety of other hat and shoe makers in the folk craft area. They plan on bringing plenty of hats, some handouts, pictures of Fiesta over the years, and a huge cut-out of St. Peter for photo-taking opportunities. Their enthusiasm for hat making will be matched by their pride in representing Gloucester and St. Peter’s Fiesta. We’re honored to have them.